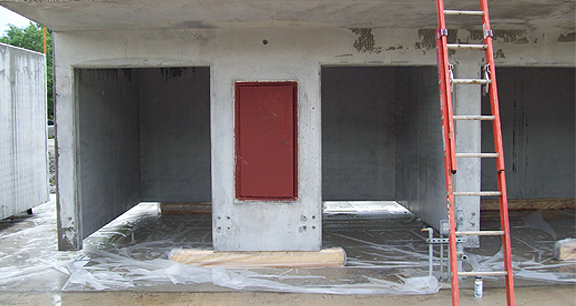 Due to high density rebar being placed in each modular unit, the contractor was concerned about voids and an even distribution of concrete throughout the formwork. To help eliminate concerns, IMI supplied imix 180, a self-consolidating concrete. Utilizing imix 180 not only assisted Rotondo Weirich with speed of placement, but also ensured that the rebar was fully encased in the concrete. The next challenge included supplying the contractor’s daily need for concrete. Forms were to be stripped from each unit within 14 hours of placement. According to the contract, 1,280 units were to be filled with concrete by an on sight crane and eight yard bucket. IMI successfully supplied 7,100 yards of imix 180 to the site. Placing concrete in hot weather presented the final challenge. The project was approximately a 40 minute drive from the plant. During this travel time, ambient and concrete temperatures were rising. To combat concrete temperatures and assist in controlling set times, chilled water, ice and chemical admixtures were added to the concrete during batching.